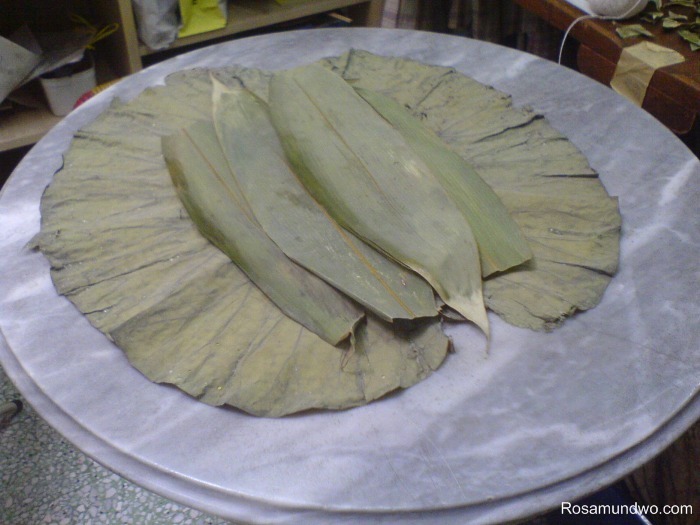 “Pillow Zongzi” or “Zhentouzong” or pillow-shaped Zongzi or pillow chung or pillow dumplings are all the same, it’s wrap using lotus leaves and bamboo leaves. 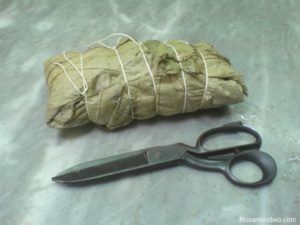 Method of wrapping a pillow zongzi is very easy, it’s like wrapping a rectangular gift box. After you place all your ingredients above your glutinous rice. 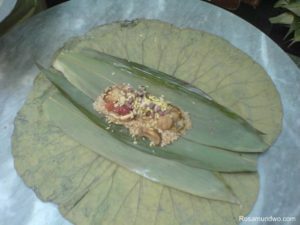 Afterward, wrap left and right side of lotus leaf, then proceed to fold top and bottom of the lotus leaves. Easy right? Just like wrapping a gift box. 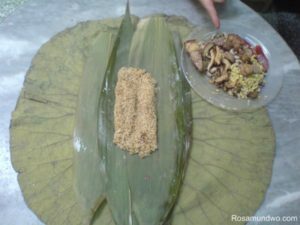 Dad taught me a very easy way to tie the pillow chung using lesser cotton string. You need to tie it tightly, 2 person is needed here.